As many of you know, I went to the American School in Pasay (now ISM at Ft. Bonifacio). My friends were a diverse group of Americans, British, Filipinos, Spanish, Chinese, Germans, et al. As a kid, I really didn’t pay much attention to who their parents were but now as I look back, I now recognize many as pillars of the community and as well as movers and shakers in the business world. 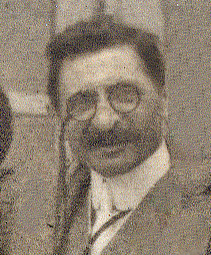 I’ve written articles on Berg’s, the Levy Hermanos of Estrella del Norte, Riu Hermanos , Brias Roxas, and Heacock’s but perhaps one of the most influential entrepreneurs in early Manila history was a Russian American Jew: Emil Bachrach. Emil Bachrach was born in Russia on July 4, 1874. He immigrated to the U.S. at age 18 where he worked at various jobs, eventually went on his own, lasting about 12 years when his health began to fail and his doctor recommended a warmer climate. After trying Arizona and New Mexico, he was intrigued by the American government’s newest colony, the Philippines. He arrived in Manila in 1901 with $1700 Mexican silver dollars (about $850) and became one of the most successful American entrepreneurs in the Philippines. He was first employed selling watches but this didn’t hold his interest. A few months later, he established American Credit Co., a sort of pawn/loan company in Plaza Santa Cruz. He opened with a few bedsteads, a couple of dressers, several phonographs and a sewing machine. Business soon grew, largely stimulated by his installment plan offer. The firm evolved into the Cosmopolitan Furniture Company and moved to its new premises at 125 Escolta. With his business running so successfully, Bachrach went on a round-the-world buying trip, chiefly ordering with American manufacturers and expanded his inventory to about P130,000; furnishings for both home and office. His primary enticement was the easy payment plan that was not readily available at other stores. He carried that installment system when he moved into his auto dealership. 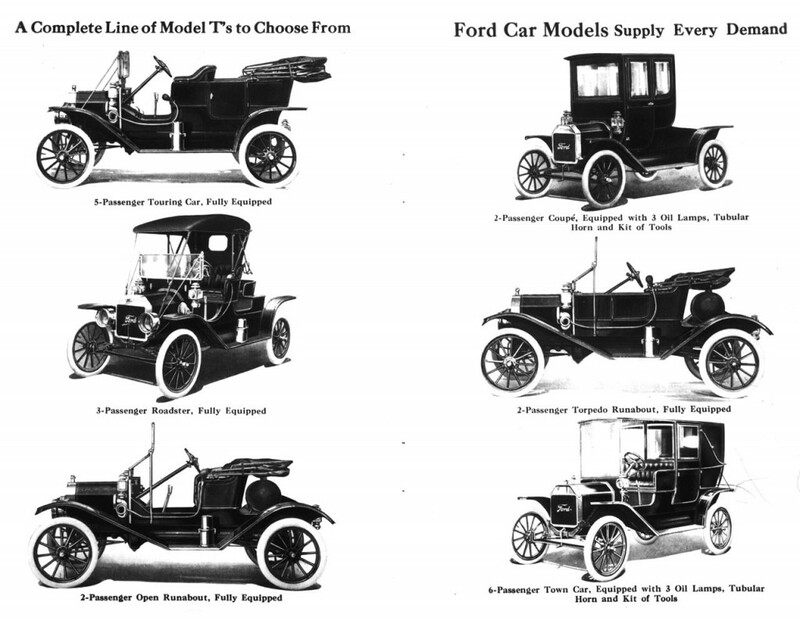 Envisioning the popularity of the automobile era, Emil secured the Ford Motor Co. franchise, and brought the first shipment of Model T’s to the Philippines under his new company, Bachrach Motors. 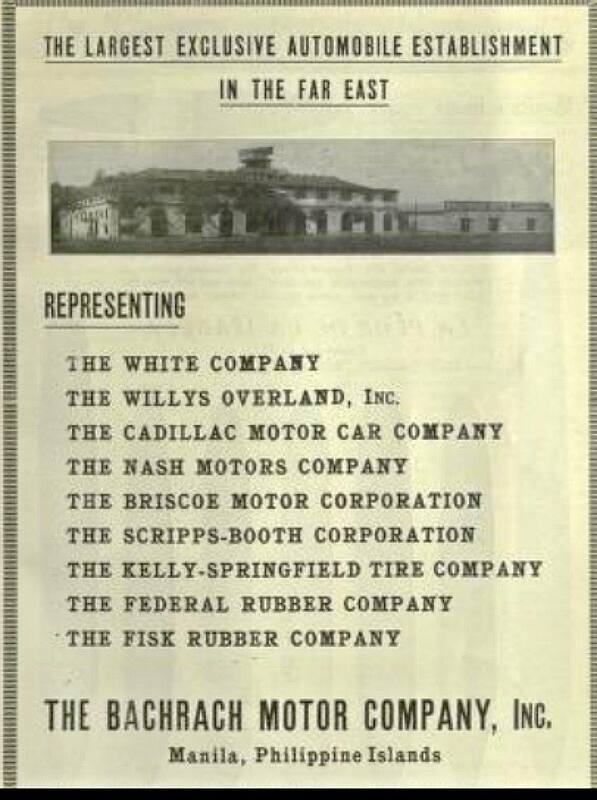 The company expanded and included other makes such as Nash, White trucks, Overland, Saxon and Cadillacs. 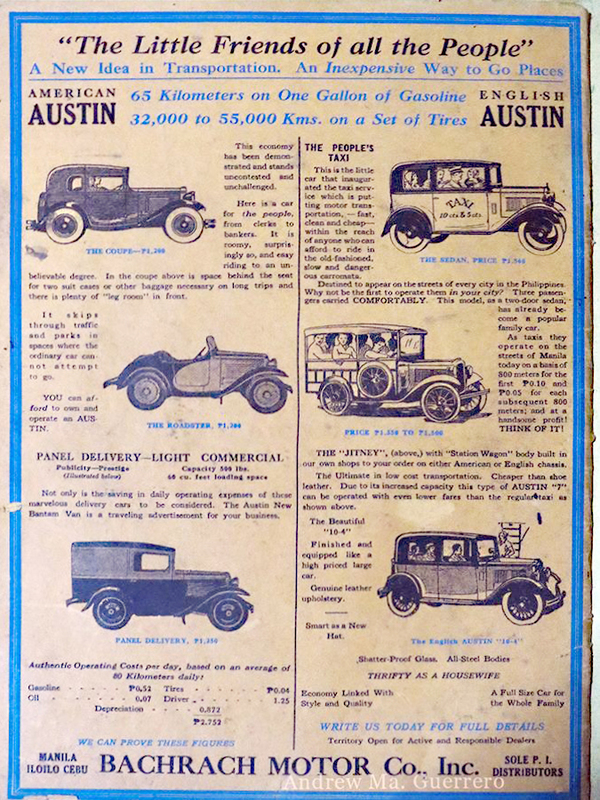 Although the Cadillacs were far more costlier than the Fords, they made a good investment as cars for hire. By 1909, more automobiles appeared in Manila, imported by Bachrach and competitors like Harry Rosenberg of Palace Livery Stables, and Leopold Kahn of Levy Hermanos. Residential homes now converted their first floor livery stables for their Victoria carriages to garages for motorcars. The new status symbol had arrived. This demand also placed pressure on the colonial government to build more roads in and out of Manila. Under Gov. Gen. Forbes’ leadership, the city and surrounding area saw a significant growth of road building. Bachrach seated in one of the first cars imported to the Philippines. By 1920, it was estimated there were about 8000 cars and trucks in the Philippines. It took about a 100 days flow from the factory to being unloaded at Manila. Financing was not as easy to get as today. Carrying his easy payment plan from the furniture store, Bachrach required a deposit of 50% at the time of sale and the balance carried by the dealership. 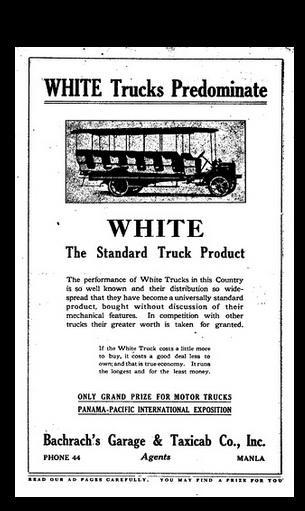 Business at Bachrach Motors was booming, especially in the truck division. Several new buildings were erected in the Port Area for the showroom, inventory, and service departments. In 1916, Emil made another great move. He met and married Mary McDonald, the proprietor/manager of several hotels: the Nevada, the Delmonico Hotel, and the Pines Hotel (in Baguio). Mary was beautiful, intelligent and a valuable business partner as well as a devoted wife. 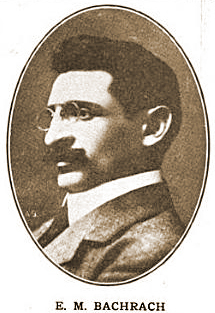 Emil’s sister, Annie married Hyman M. Levine. Their daughter, Minna married Bernard Gaberman, a white Russian immigrant and stockbroker. In 1963, Gaberman and several other financiers founded the Makati Stock Exchange. In a perfect example of being a small world, the Gaberman children, Mari and Earl, were my classmates at the American School. Emil had a reputation as a tough businessman and was known to finesse many deals to his advantage. Many young men took the opportunity to train under his leadership and gain experience with very little salary or share in profits. However, Emil’s business sense, contacts and experience were invaluable in helping others get started in their own business including Henry Belden, who later became president of AG&P, and Hyman Meadows. In 1928, Hyman Meadows arrived in Manila on the S.S. Thomas with the Army Medical Corps but joined up with Bachrach soon after, learning about business and salesmanship. 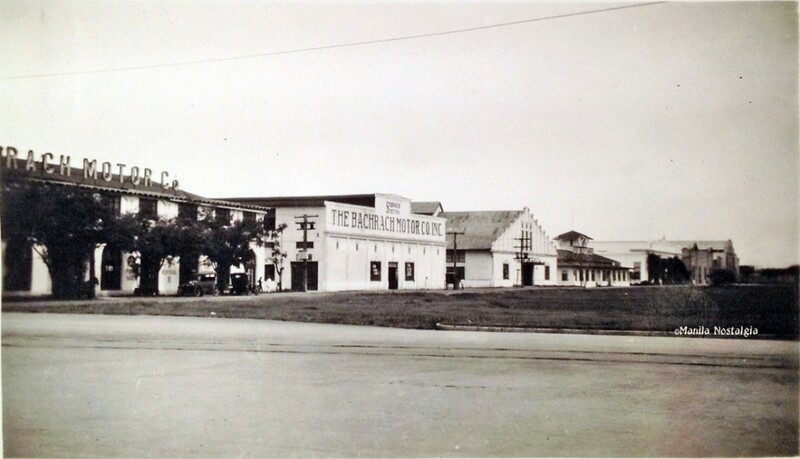 His experience with Bachrach was later put to good use when he opened his own business, Manila Office Equipment Co., sometime in the mid-1930s. Pedro Reyes started out as a mechanic at Bachrach Motors. 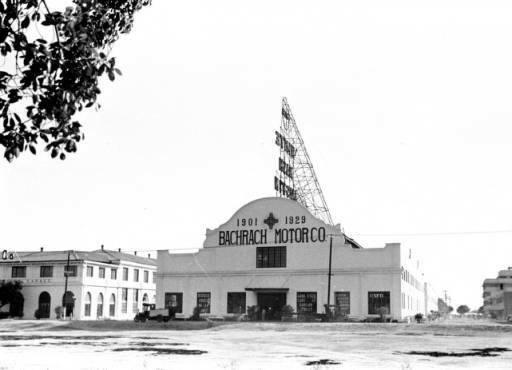 He eventually went on his own, forming Manila Motor Works and also later bought the taxicab business of Bachrach Motor Co., and the ruins of the old Baguio Theater, also Bachrach owned, with the help of a no-collateral loan from Mary McDonald Bachrach. Bachrach’s economic successes allowed him to be a generous philanthropist, who supported both Jewish and Christian causes. He was also active in the American Chamber of Commerce, Casino Español, and Sociedad del Tiro al Blanco. By 1918, twenty years after the Americans took over the Philippines, the Manila Jewish community totaled about 150 people, including a number of Russian Jews who sought asylum from the white pogroms of the Bolshevik Revolution. 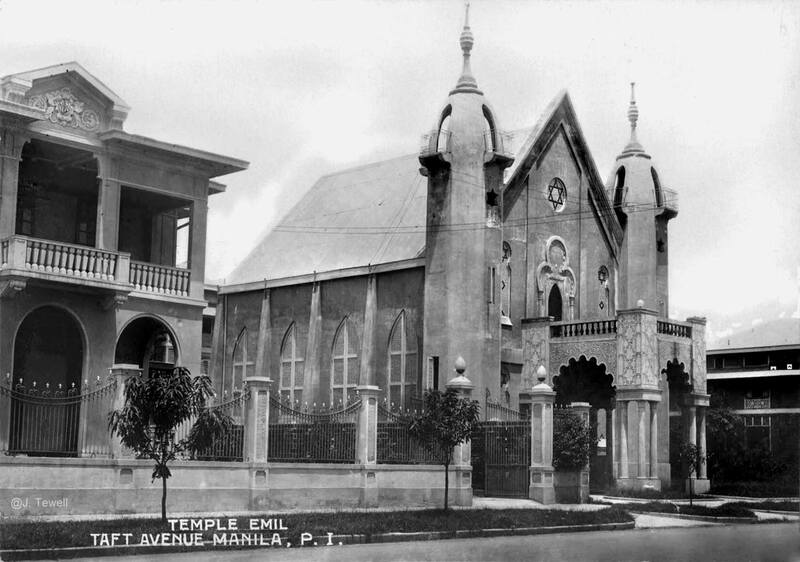 In 1925, with funds donated by the Bachrachs, the first synagogue was erected and named the Jewish Temple Emil which was located on the west side of Taft Avenue just north of San Andres Street approximately where Marc 2000 Tower, PhilHealth Office, 1973 San Andres Street is today. The building was destroyed during WWII. Now wealthy, Emil and Mary moved into their newly remodeled home in Santa Mesa on Calle Manga. ”Casa Blanca” had a succession of residents from Horace L. Higgins, a British engineer of the Manila Railroad Co. Ltd. of London to James Chapman Rockwell, VP of the Manila Electric Railway and Light Co. in 1911, before the Bachrachs purchased the property and remodeled it extensively to its finest state. As you approached the two story palatial estate, the first thing you would notice was the circular driveway leading to the great porte cochere and vestibuled entrance. Photos are from an article about Casa Blanca in an issue of This Week, Oct.15,1950 sent to me by Sandra Holmes. The house was white hence the name and the soft tones offered a sense of restful comfort and perfect taste. With two bedroom suites and a large guest room, all of which had a wonderful view of the city, the home had the feel of a clubhouse. Off the lobby were the billiard room, bowling alley and a complete gymnasium. In an outer court at the rear of the house was the tiled swimming pool. The high-ceilinged dining room was spacious and tastefully decorated using maple wood with a high mahogany finish. It was an also ideal setting for political and business meetings. As a close friend of President Manuel Quezon, Bachrach often opened his expansive and quiet gardens for private negotiations with members of the American Chamber of Commerce. Not only did Bachrach popularize the idea of a Ford for every Filipino, he also began the Philippines’ first commercial aviation company, the Philippine Aerial Taxi Corp (PATCO). Although Philippine Airlines (PAL) was officially founded on February 26, 1941, its license to operate as an airliner was derived from merged Philippine Aerial Taxi Company established in Dec.3 1930 making it Asia’s oldest scheduled carrier still in operation. Commercial air service commenced three weeks later from Manila to Baguio making it Asia’s first airline route. Bachrach’s death in 1937 paved the way for its eventual merger with Philippine Airlines in March 1941. Bachrach’s majority share in PATCO was bought by beer magnate Andres R. Soriano in 1939 upon the advice of Gen. Douglas MacArthur and later merged with the newly formed Philippine Airlines with PAL as the surviving entity. Beech Aircraft delivery for PATCO. The photo above shows the Beech Aircraft in its shipping container bound for Philippine Aerial Taxi Company in Manila. 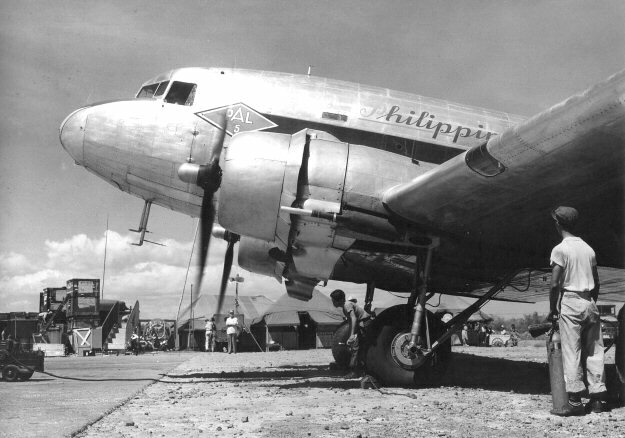 The merged Philippine Air Lines started service on March 15, 1941 with a single Beech Model 18 NPC-54 aircraft, which started its daily services between Manila (from Nielson Field) and Baguio, later to expand with larger aircraft such as the DC-3 and Vickers Viscount. Emil Bachrach passed away on Sept. 28,1937. 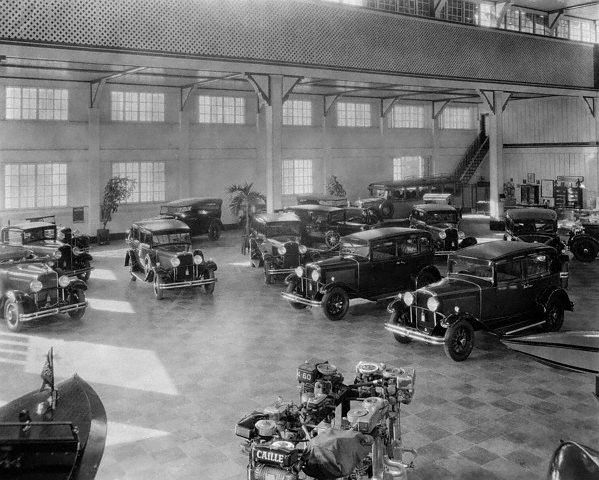 Bachrach Motors continued operations with brother-in-law Hyman Levine at the helm. The photo below shows Levine at a despedida party for a Goodyear executive in 1960 (courtesy of Earl Gaberman). Bachrach bequeathed P10,000 to the Temple Emil Congregation. 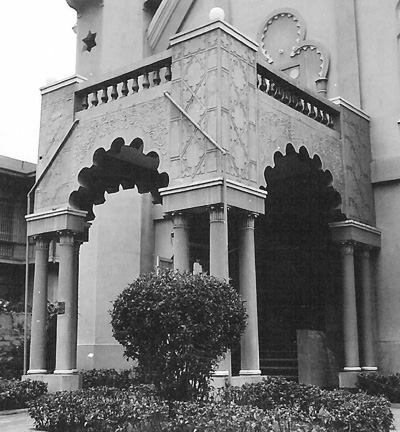 The funds were subsequently used by the community to enlarge the synagogue and construct the Bachrach Memorial Hall. During occupation, the Japanese converted Temple Emil to an ammo dump. 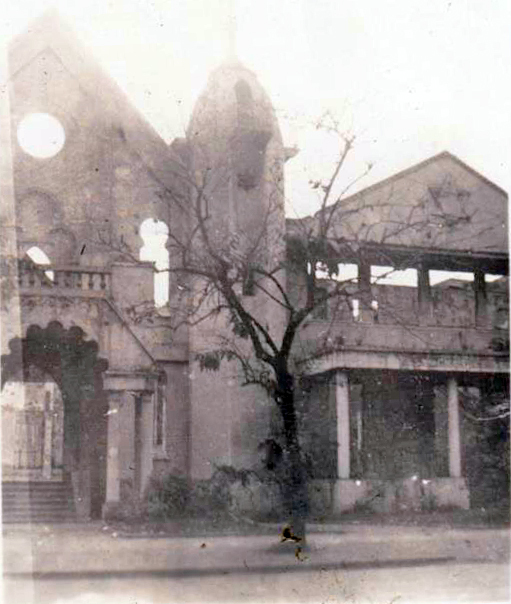 During the fighting, the stored ammunition ignited and blew both the temple and community house. The Temple was subsequently restored in 1947. The importing of autos proved too expensive during the Fifties as the import duties were sky high. I remember my dad wanted to bring over our new 1955 Chevy Bel Air from the U.S. He had to drive it around the L.A. area for a month or so to add mileage to the car thereby bringing it in as a “used” car and substantially reducing the import duty. By now infirmed, Mary Bachrach left Manila in the early Fifties and settled in the U.S. Casa Blanca was turned over to the Club Filipino which was there until the new clubhouse was inaugurated on October 18, 1970 in Greenhills, San Juan. Bachrach Motors finally closed down in the mid-Sixties. The buildings in the Port Area were leased to U.S. Tobacco after their own buildings suffered severe damages from a huge fire. Emil Bachrach will be remembered as a tough businessman and negotiator as well as a benevolent philanthropist who certainly helped shaped the history of Manila’s economics. Thanks to Earl “Butch” Gaberman and Mari Gaberman Solomon for their invaluable help with photographs and background on their family’s history. As always, I welcome your comments, stories and pictures of Manila’s history. Please email me at Manilanostalgia@gmail.com. I don’t know if this passed muster!! Another beautifully written memory booster!! Thanks for all you do, Lou. And thanks to Butch and Mari for their wonderful contributions! The Gabermans and my family were good friends. Love reading this thank you! Enjoyed this very much. Is Casa Blanca still standing? Congratulations, Lou, on another fine and meticulously researched article on one of Manila’s business pioneers of the American Colonial Era. Thank you Lou for another great work. You writings and research keep Manila Nostalgia alive. Hello Mr. Gopal. Here is an odd, and somewhat sad, postscript to the Bachrach story. From 1999 to 2001, I worked for Mr. Jose Roberto Delgado’s Transnational Diversified Group, whose principal offices were (and I believe still are) at Mary Bachrach Building in the Port Area, behind Manila Hotel, at Ambassador Antonio Delgado corner 25th st. The building is quite large. There was a small parking area in an internal courtyard, where I would sometimes park. On most days, I would see an older man hanging around, who would sometimes help me park. On one occasion, I arrived at the same time as my boss at the time, Wilfredo Q. Villar (now unfortunately deceased). The old man helped me park, and as I got out of the car, I gave him a small bill. Willy saw this, and chuckled to himself. As we were entering the building, he asked me: “Do you know who that old man is?” I said no, but I would see him practically every day. Willy said, “Well, believe it or not, that guy is our landlord. He owns the building.” It took me a while to absorb this. I asked, if this was true, why was this guy hanging around watching cars? Willy said to me, the guy was the houseboy of the daughter of Mary Bachrach. She had no heirs of her own, and gave most of her estate away to charity. She left the building to her driver and houseboy. The driver was already old and died soon after, but had sold his share to the houseboy. The houseboy rented out the building to all the companies, including ours, and was quite wealthy for a short while, until his relatives learned of his good fortune. In short order an entire town of relatives (and supposed relatives) descended upon him, and were now living in one section of the building, completely economically dependent on the former houseboy’s largesse. None of these parasites worked for a living (if indeed they ever had), most of them spent the whole day drunk, and gambling or watching TV. With such an enormous overhead expense, the former houseboy was no longer wealthy, although at least he had food to eat and a roof over his head. So he spent his days hanging around the parking lot, like a watch-your-car boy. For all I know, he may still be there today. What a bizarre story. I wonder if the houseboy still owns the building ? Thanks for sharing that story, Apa ! An error- according to Villar, the man was the houseboy of Mary Bachrach herself, not “the daughter of Mary Bachrach”. Thanks so much for this, Lou. When my parents arrived in the Philippines in 1949 Aunt Minna and Uncle Benny (Gaberman) taught my parents the ropes. Aunt Minna took my mother to Quiapo market and taught her how to get the cuts of meat she wanted from the carcasses lined up on hooks and how to shop for fresh fish. 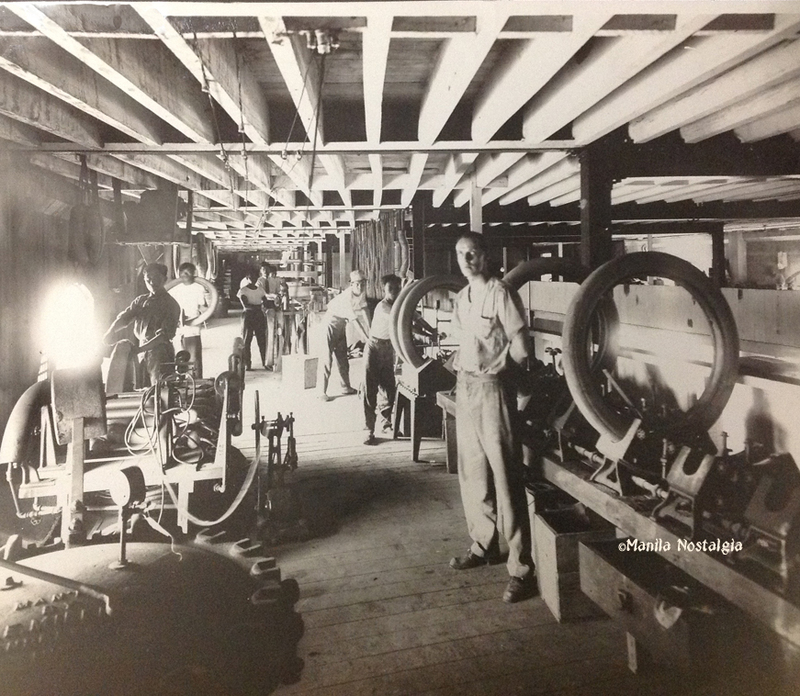 Henry Belden was my dad’s boss at AG&P before he left and eventually started his own business, B.B. Fischer and Company which is still an ongoing concern today. BBFRock. Pio Cacaam, my dad’s CEO, and I still correspond; he keeps me posted on all the happenings of that extended family. I want you to know how wonderful this information and these memories are are to me: I didn’t know the “who’s who” of Manila, either, growing up. No early childhood networking in those days…. we were unquestioning and very open….. I understand the house is still there but I haven’t been able to confirm this. The houses in that corner have been replaced by school buildings. Next door lived Antoine Brimo. His son, Henry Sr., who wrote a diary of the Occupation, noted MacArthur spent a couple of nights there after the bombing of December 1941. The area is a hill, breezy, flood free, and far from any military targets. Mrs. Bachrach moved to San Juan around Sept. 6, ’42, to make way for a Japanese civilian. The Kempeitai also used Manga Avenue as a safe haven in the late stages of the Occupation. After some delicate negotiations, they took some houses deeper in the street and guaranteed the others wouldn’t be ‘occupied’. Displaced residents stored furniture and valuables at Antoine’s house. Nevertheless the Army and Navy tried and failed to take more houses — the three branches didn’t love each other, but that’s another story that explains Iwabuchi’s stand. Upon his return, Mac moved into the Casa Blanca again around Feb. 14, ’45, while his Manila Hotel penthouse was being repaired. Col. Soriano moved into the house opposite Antoine’s. The security detail allowed my dad to use the Casa Blanca pool one day. He even had tea with the Mrs. once. They cleared Antoine’s fence of Bougainvilleas to prevent a sniper hiding behind it after my dad warned them that Mac was easily seen pacing across an open window. By the time I saw the mansion across the fence in the late 50’s, the Bougainvilleas were back so I only recollect the pool, fence and roof. What a marvelous bit of history. Thank you for sharing that with us, Henry ! With your permission, may I clip your excellent work on our FB page? I want to thank you for this wonderful blog!! It is so beautifully done, and very exciting to me — Emil Bachrach was my grand-father’s uncle, and I grew up in NYC hearing many stories about a very beloved and admired “Uncle Bachrach.” But I never saw a photo until NOW, thanks to you. My grandparents were Luba and Mark Elianoff. Mark’s mother was one of Emil’s sisters. They came to Manila from Moscow in 1928, I believe. She had a dress shop, Louise Brown, and I think Mark worked for his uncle. She left, with my mother, just before Pearl Harbor and settled in NYC, while Mark somehow survived the war there and then came to NYC, where he never wanted to talk about those years. Thank you very much! Your work really means so much to me. Please email me if you have a moment, so I can at least know that you received this comment. All warmest wishes from NYC. I used to live in Manga Avenue and once or twice I went to Casa Blanca with other kids living in that street to watch movies and be with Gen. Macarthur’s son Arthur. I used to live across the street from where the Gabermans lived later on and I am even now a friend of Butch Gaberman. Your an old timer in Sta Mesa, my Grand Father used to live inside The Burgos Elementary school, and I grew up in Altura street. My Grandfather’s cousin use to be the servants of Bachrach. My father recalled that when they drain the swimming pool, all the catfish will come out form the canal on the corne of Buenos Aires and Altura street. How are you related to Luis “Chito” Ayesa, the La Salle Olympian swimmer? He was my cousin’s friend and classmate belonging to the “Last and Mighty Class of ’68” batch, De La Salle Taft High School. Lou, you’re born after the war, not during the heyday of the Bachrach’s but the stories and the photos here are shouting that you are not only the narrator, you are in their midst invisibly portraying a special role in their lives. As a storyteller, you captured everyone’s imaginations with this article about the Russian Jewish business pioneer in our country. You made us, readers, stood still in awe about the inspiring success adventure of Emil. He sets an example for every Filipinos how to excel in our lifetime. A very good writer indeed, Mr. Lou. Just like your AS story, wonderful, touching. I’ve got so much information about that school from you, even my son graduated from Arellano Law School, which you said was the former American School in Donada street in Pasay. Prem, another article that amazed me was the Sindhi’s story. It was just unfortunate that your Dad left so early while you and your Mom needed him most during that time. Anyway, you and your Mom loved each other until you met your stepdad as life progressed. Really fascinating for me, because the Indian community were there already, not a few as i previously thought.Thanks again Mr. Lou. This message to Alfonso Preysler Ayesa, are you related to Enrique Iglesias? I enjoyed reading Philippines history, I knew about Jewish community in the Philippines existed during “peacetime” what my father used to call the era. I myself , got fascinated about Philippine history. I found out that Enrique Iglesias, related to Steve McQueen by marriage Nellie Adams (Philippine born) sister of Lou Salvador Sr. You know the Salvador Clan, and also connected to Sylvia la torre, since her granddaughter last name De tagle related to Enrique Iglesias. Talked about small world for history. My relatives use to be the servants of the Bachrach family. According to them the Bacrach family are so kind and generous and they repay there servant very well. When they left, my relatives was appointed as caretaker to their old building near the port area of Manila. The mansion was demolished to give way to a school. Ialso used to live nearby that place, in the 70’s the old swimming pool was still there and we use to play. Can you help us to contact Earl or Mari Gaberman? Both Earl and Mari have requested that they not be contacted. I’m sorry. Do you know that the Mary Bachrach building in Port Area is in danger of extinction? Yes, unless its historical worth is revived and original design is restored. There is now an urgent effort to do this and I am part of the team helping to preserve this valuable historical architecture. Having read your writings above, I know that you are very knowledgeable and well informed of the history of this building as well as the owners and I am very hopeful that you can help us preserve a building which is already part of our Philippine history. Moving forward, we are preparing the “as-built” drawings and records pertinent to our main goal of convincing the National Historical Commission that restoration of this building to its original state is still possible. To do this, we need extensive research and come up with records that will help us show in our drawings the realistic original character of the building and provide some write-ups pertaining to its history to convince the NHC that this building was indeed a part of our colorful history and deserve preservation for future generation to treasure. In this regard, may I seek your valuable contribution by providing us records to help us succeed in our main goal of preserving this building, especially so that the owners are willing to fund its restoration. Any photos, historical writings, old plans or any pertinent documents or even oral discussions would be a very helpful materials in this undertaking. You can contact me for any feedback on my e-mail below. Your help will be highly appreciated. Thank you very much. May I recommend you join my Manila Nostalgia Facebook site ? I will send you an invitation. Then you can do a search on the Port Area and the Bachrach building. There is a wealth of information provided by many of our members who are researchers and historians. Thank you so much. Your help will be a valuable contribution for the preservation of a historic building. And by the way, I am using part of your writings about Mary Bachrach building. Thank you very much.